Goat Man and Daddy Almost Butted Heads at Jacksonville, Ga. Along in the 1950s or so The Goat Man came through Jacksonville, Ga. Things were going OK until he started whipping one of the little baby goats. J. D. Williams, my father, who ran a store in Jacksonville, Ga., could not stand that sight. He immediately confronted The Goat Man and I thought there might be a fight over the issue. But The Goat Man moved on and Daddy returned to his store. Daddy always liked babies – even baby goats! 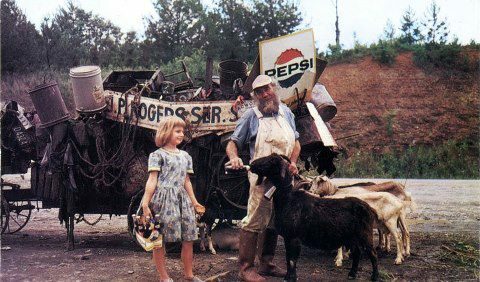 I’ll always remember the day The Goat Man came to Jacksonville, Ga. His arrival, of course, was precede with interesting stories of an unusual unwashed bearded man with a seemingly unending mission – traveling to and fro all over the country with a homemade cart pulled by a bunch of goats. I was talking to James Hatten of Jacksonville, Ga., the other day and James said he remembers riding his bike down to the river with some of his buddies many years ago and observing the unorthodox entourage which was making its way – slowly but surely – to the little town of Jacksonville, Ga. James said the little train had camped at the river the previous night. That might have been the same time I remembered The Goat Man’s visit to Jacksonville. Must have been way back in the 1950s or so. Now, The Goat Man was not too concerned with what most folks center their attention upon. For instance, he did not seem to be bothered that taking up the main portion of the highway with his goat train was also creating a rather large motorcade to his rear – composed of cursing drivers with overheated engines and tongues expelling anger of a comparable temperature. I am told the traffic situation got so bad in South Carolina that the highway troopers would meet The Goat Man at the state line with a semi truck, load up the whole sordid menagerie and deposit them a little later on the other side of the border in North Carolina where there also was no welcome mat. I can imagine that was quite traumatic for The Goat Man and his goats as they breezed along on the flatbed at 70 miles per hour. Compared to what they were used to that must have seemed like rocket travel! But in defense of The Goat Man, even though born in Iowa, he was a Georgian by choice and evidently a proud one who was defying conventionalities right and left. Someone said The Goat Ma had his eyes upon the President. If things got hot in the White House he could opt out of getting on Air Force One and just hit the trail with the goats! But, evidently, his reasoning of having many potential votes because of his many contacts held up only in his mind because once you got a good whiff of the situation you did not especially care for those winds of change. But hand it to The Goat Man – he was a free spirit doing his thing even if contrary to the thoughts of the general populace. But to his credit, if that, he had little competition. But that is not to say he did not create controversy. And create a stir he did when he came to the little river town of Jacksonville, Ga., during my teenage years in the 1959s. Everything was going as well as possible that hot summer day as he pulled his loaded cart of everything imaginable off he road between the then bus y lanes of Highway 441 and my father’ general store. And, then, the somewhat sublime, if odoriferous, tranquility came to an abrupt end. For some reason, or maybe just to get a little attention, The Goat Man started whipping one of the baby goats. I sensed there would be trouble because I knew my daddy, J.D. Williams, loved babies. From the way he tore out of the door of the store, I further assumed this love extended to all babies – even baby goats. In an instant The Goat Man and Daddy were in each other’s face and I was astonished because Daddy usually could not be upset easily. But The Goat Man had called his number with the thrashing of the little goat. He informed Daddy that those were his goats and he could do with them s he pleased. Daddy quickly countered that he could not misbehave so in front of his store and in the middle of town. He informed him that all the people there did not appreciate viewing such a cruel and unsavory spectacle as he was putting on. The fuss continued for a short while, neither man giving an inch but somewhere The Goat Man detected that Daddy was not going to allow the behavior and moved on down the highway. I have often wondered what happened to the little goat. Probably made it fine. Some folks said they saw The Goat Man kissing the little goats in the mouth and talking “goat talk” with them. I think that is probably right and he just showed out a bit that summer day just so Jacksonville would liven up a bit. If so, he accomplished his purpose. I had never seen daddy so fired up but as one of the old local mechanics used to say about the electrical system of Model T’s –“there was enough fire there to burn a wet mule.” Or a wet goat. Sometime after that notable event, for some unknown reason, my father bought some goats. Maybe he became interested in them because of the confrontation with The Goat Man. And then again he might have just wanted tom try goats. We had tried cows. Mother and I would get up a 4 a,m. in the morning and milk the cows and clean up the barn and have the ilk ready to put in our general store in Jacksonville, Ga. That milk was good. You could see the cream up at the top of the bottle. I am glad that venture did not last too long. I never could get used to getting up at four in the morning. Anyway, not too long after our getting the goats, I was trying to court a girl in Coffee County, just over the river from Jacksonville, Ga. She lived way out in the country and while waiting for her I became engaged in conversation with her father. Like my daddy, he liked to try new things. The conversation somehow turned to “goats” and I asked him if he might be interested in obtaining some of those prized animals. Indeed he was! I told him if he could have a truck over to our place in a day or so I was quite sure he could acquire about 42 of the precious things. He brought the truck and he became the proud owner of 42 goats. I have often thought about Daddy and The Goat Man and the goats. Goats, as everything else, have a place in our lives. In the life of The Goat Man they had a big place. I can see him now drinking that goat milk and putting it in what he called coffee. And I am thankful Mother and I never were assigned the talk of milking goats – just cows. But goat milk has a place. Years ago a couple appeared at the home of my Grandfather Anderson and they needed goat milk for a sick baby. My Grandmother Anderson always thought the couple was named Yearty. Many years later I married a young lady whose maternal family was named Yearty. And the location for the family at the time fit. So you can never tell. My wife and children might be living today because of someone, at sometime, was able to get hold of some goat’s milk at the Anderson place. J. D. Williams, my daddy, of Jacksonville, Ga., died at the age of 86 in July of 1998. Mr. Ches McCartney, The Goatman (sic), of Jeffersonville, Ga., died in November of that same year at the age of 97. Somewhere in the eons of the hereafter I believe they are having a good chuckle over their “goat talk” that occurred at Jacksonville, Ga., many years ago. Credits: James Hatten for his account; T.R. Mobley for “Old Days and Old Ways in South Georgia”; personal experiences; other sources.